What if God visited you in a dream and told you to ask for anything you wanted? Would it be hard for you to pick just one need? Or do you have a huge miracle you are pleading with him to perform? King Solomon found himself in this very position, as recorded in 2 Chronicles chapter one, and also in 1Kings chapter four. 8Solomon replied to God, “You showed faithful love to David, my father, and now you have made me king in his place. 9O LORD God, please continue to keep your promise to David my father, for you have made me king over a people as numerous as the dust of the earth! Solomon asks for wisdom and knowledge, and God is faithful to grant him his request. Not only did God give him this wisdom, but he made sure that Solomon recorded much of it in his Word. King Solomon wrote Song of Solomon, Ecclesiastes, and many of the Proverbs. Why does this matter for women in today’s world? We don’t need trends of the times dictating how we live our lives. As believers in our Risen Lord, we need real, ancient truth to show us the way. The word of God is old, but it is alive and active and sharper than any two edged sword (Hebrews 4:12). When we approach it as such, with our questions about priorities, disappointments, and flailing disobedience, God calms us and refocuses us on what’s really important. With the gift of liberation of women as equal partners with men, we have been given the opportunity of many pursuits. With this gift, we must seek Jesus about how to properly put Him first, and keep all our other relationships and responsibilities in order. This is so hard in 2017! The truths recorded in the book of Proverbs help us to hear His voice and re-prioritize. We all get the same 24 hours in a day. We just need to abide in Him to put first things first. We do that through seeking Him in His word daily. 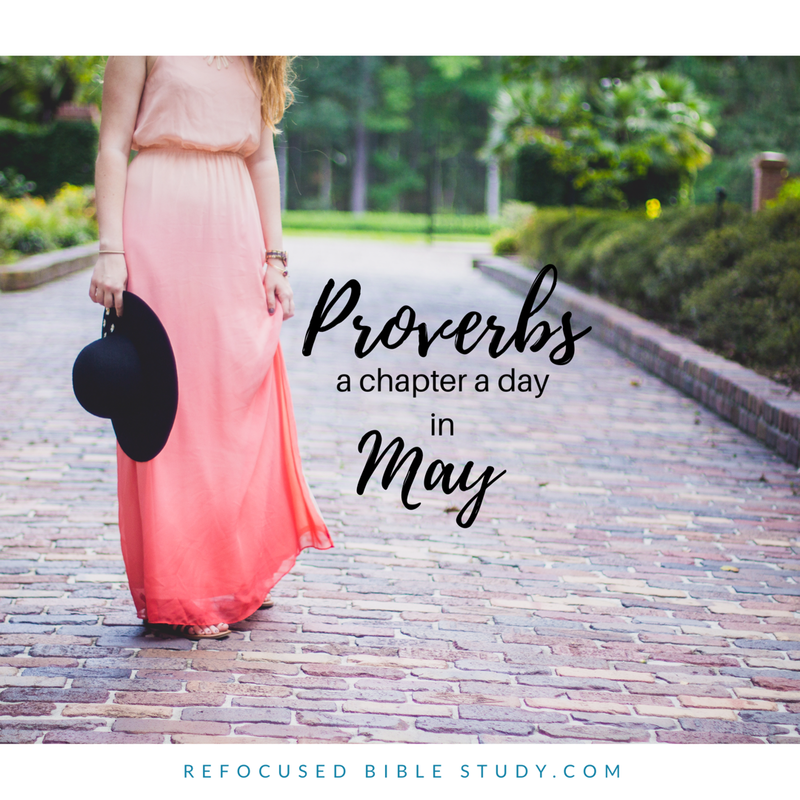 That is why I hope you will join us here at RefocusedBibleStudy as we read the book of Proverbs together in the month of May! I will be posting Monday, Wednesday, and Fridays here on the blog, and Monday-Friday on social media. I am excited to be partnering with some other Christian bloggers who will be guest posting here on Wednesdays! I love to see women who are wild about the Word of God come together and encourage each other in Him. So I hope you will join us as we read Proverbs, a chapter a day that coincides with the date. There are 31 days in May and 31 chapters in Proverbs! We will start on May 1st, so grab some friends and join us!